Continuing this popular programme of public courses, I will once again be running this 3-day creative metalwork course, taking place over 3 Saturdays in September 2016: 3rd, 10th and 24th. You will be working in steel in order to develop both a hands-on knowledge relating to the processes for sculptural fabrication, as well as a sculptural language in constructed metal for its own sake. This could result in linear and rhythmic forms in space, or volumetric and contained forms. I have two new works that have been selected for ‘Converge 2016′, Visual Arts Scotland’s exhibition in Edinburgh. 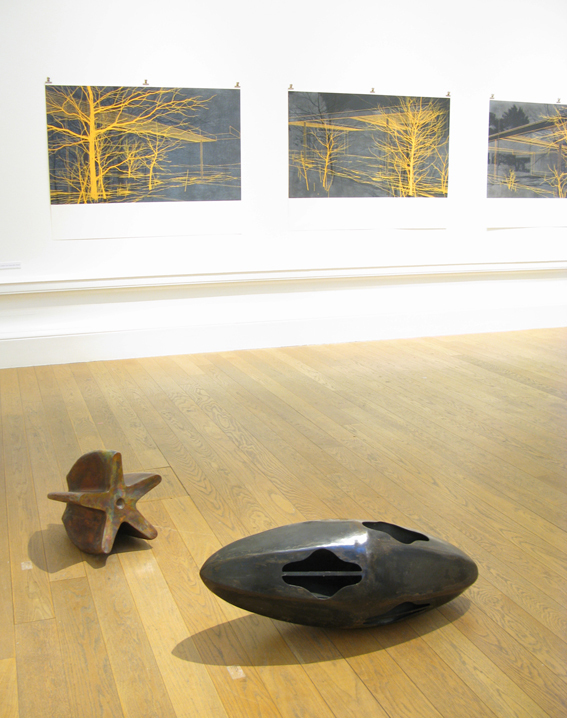 ‘Greta’s Star’ is a small copper sculpture; ‘Sleeper (Bird’s Egg)’ is larger, steel piece. These are part of an ongoing series of work, the themes of which were developed during a period of research as part of my Gottlieb Foundation Award. These abstract works take inspiration from natural and artificial forms to create new trains of thought based in memory, landscape and movement. A sense of metamorphosis is a key underlying factor. Visual Arts Scotland is now a leading platform for national and international contemporary fine and applied artists. It offers both emerging and established practitioners the opportunity to showcase their work and reach a wide audience in the heart of Edinburgh in this annual exhibition. Originally an organisation for women artists, VAS has, since the 1980’s, highlighted and promoted fine art practice alongside the applied arts and design. 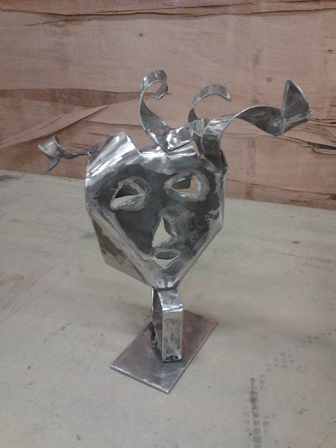 An ambitious and inspiring variety of work was created in the October Creative Metalwork Course, from Rob Welsh’s stove to Dougie Muego’s meticulous figurines and Magda Brionglos’ mask sculpture. 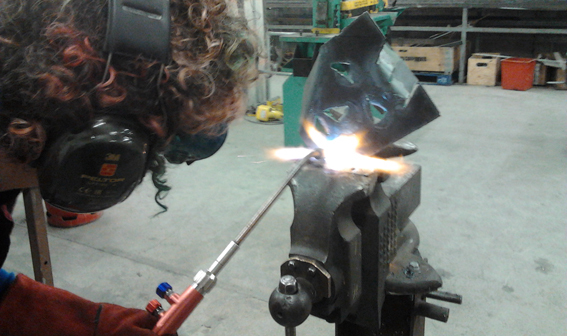 Launching into a variety of technical and sculptural techniques, the participants, mostly new to working in metal, produced work that set a grounding for further exploration into the medium. 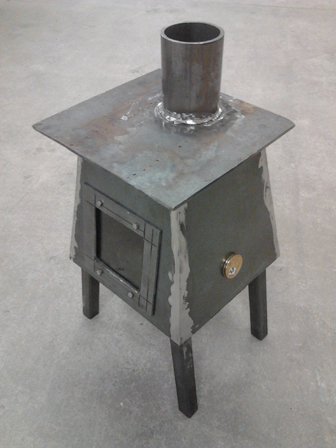 If you like the sound of this, why not participate in my first Creative Metalwork Course of 2016? It takes place over 3 consecutive Saturdays on 13th, 20th and 27th February 2016, from 10.30am – 4pm each day, and with a maximum of 6 places, you will receive high-quality teaching in a well-equipped workshop. Also see the Lectures and Courses page. 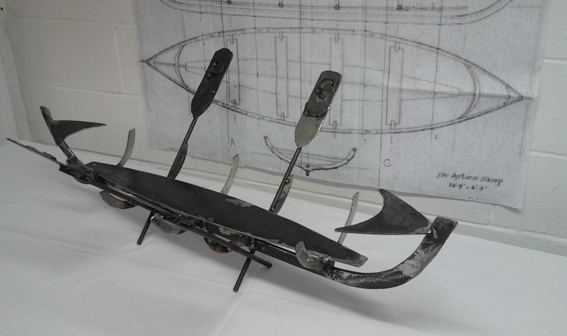 In April this year, Joe collaborated with Row4Shore Glasgow North to create a sculpture symbolic of the St Ayles skiff, designed in kit form by Iain Oughtred and based on a type of rowing boat used for traditional coastal racing. Row4Shore are a local community group who plan to set up a charity to build one of these boats for use by young people. 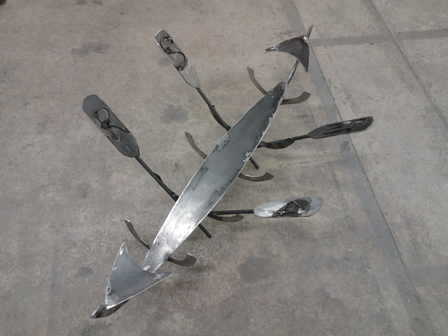 To build teamwork in the group, it was decided to create a metal sculpture that symbolised the project, taking inspiration from abstracted elements from the boat. 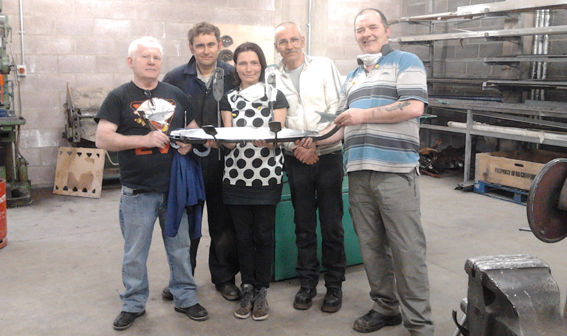 Working in steel, the group learnt and honed their creative and metalworking skills alongside Joe at Glasgow Sculpture Studios metal workshop. The work took place over five two-hour weekly sessions between February and April 2015. A further course at Glasgow Sculpture Studios will take place over 2 consecutive Saturdays on 21st and 28th February 2015, running from 10.30am – 4pm each day; for further details see Lectures and Courses page. The next course at Glasgow Sculpture Studios, now in the Whisky Bond, will take place over 2 consecutive Saturdays on 24th January and 31st January 2015, running from 10.30am – 4pm each day; for further details see Lectures and Courses page. Joe has won a major award from the Gottlieb Foundation in New York in the form of an Individual Support Grant worth $25,000. These are given annually to 12 artists worldwide in recognition of the quality of their work and dedication to it over a period of at least 20 years. 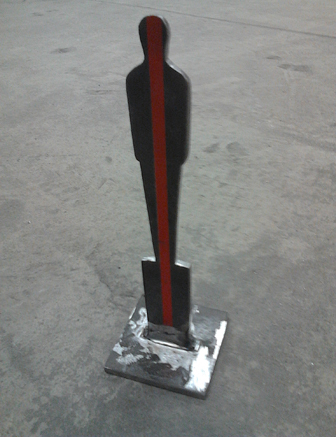 This will enable Joe to develop and further his sculptural practice over the next twelve months. The Adolph and Esther Gottlieb Foundation was set up in 1976 to provide direct financial assistance to individual artists. 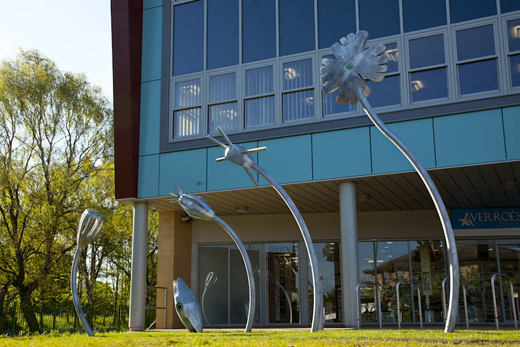 ‘Waterland’ was completed and installed at the Bulwell Riverside Joint Services Centre, Nottingham and opened on 17th May 2012. The work comprises a series of five sculptures inspired by the microscopic desmids and diatoms that inhabit freshwater rivers, and in particular the adjacent River Leen. Local schools were involved in the creation of drawings and objects for the time capsule, which forms part of the smallest element. The sculpture was funded by Arts Council England, Laing O’Rourke and GN Lift Co.
Joseph Ingleby has recently been commissioned to undertake a series of works to be sited in front of the new Bulwell Riverside building, a joint services facility for Nottingham City Council. ‘Waterland’ will consist of five pieces in steel and copper, creating sculptures inspired by Bulwell and the microscopic natural forms present in the River Leen adjacent to the site. The commission is funded by Arts Council England and is due to be installed in Spring 2012. See drawings and models. The next course will take place the weekend of 29th-30th October 2011; for further details see Lectures and Courses page.